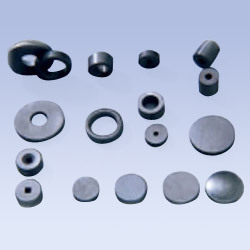 Hard ferrite magnet is essentially composed of SrO or BaO and Fe2O3 by ceramic processing technology. Hard ferrite magnet is manufactured under a powder metallurgy process and classified into two types: Isotropy and Anisotropy. Isotropy is molded in absence of magnetic field. Anisotropy can be further divided into "Wet" and "Dry" depending on pressing methods. Excellent corrosion resistance and good resistance to demagnetization. The tolerance is generally +/-0.2mm, it also depending on magnets shape. For a special application, the dimension tolerance could be reduced to +/-0.05mm by grinding after machining process.